Who would of thought that a city boy like myself could have enjoyed his time as much as I did in small town Kindersley? I came to Kindersley from Edmonton knowing pretty much nothing about the SJHL or the Kindersley Klippers. The main thing was, I knew it was a chance to call hockey games, and get my foot in the door with my 1st full time radio gig. I came to Kindersley as a 19 year old fresh out of school, looking to make a name for myself, and I feel like I was able to do that. I made alot of friends in this town, but the most friendly people by far were the people around the hockey rink. The entire Klippers family, welcomed me with open arms and made me feel right at home. First off I am going to miss the players and the staff. When you go on the road with a hockey team you spend so much time with each other, you become great friends. Being in the same age group with most of the players, it was almost impossible to not become friends. Their are alot of great kids playing on the Klippers right now, who have really bright futures. I wish them all the best moving forward. Rockie Zinger and Chris Forsman have also been great to me and allowed me to feel like I was part of the team. I know alot of Kindersley fans are critical of the coaching staff for the way the season has gone but their is a few things I want people to remember. The team last year was built to win it all and unfortunately they were not able to. With 9 players leaving last season, the cupboards were empty for Kindersley heading into this season. Rockie Zinger and Chris Forsman have done their best to try and restock the cupboards and rebuild so that this team is strong for the years ahead. Their is a ton of young talent on this club right now, and I really feel they are headed in the right direction. I really do feel that alot of the back lash that Zinger has gotten is unfair. It's hard to judge someones coaching ability when your team is so young. Having said that it will be up to Zinger to make sure these kids develop and full-fill their potential. Some people forget that Zinger is a young coach also, and still developing his coaching skills. In the off season when the players look back and the coaching staff looks back, it will serve as a great learning experience. Next year will be a fresh start with everyone on the roster right now having the potential to be back. Sure you can be upset with the way the season has gone, but the team has been set up very nicely for the future, and I would like nothing more than to see this current group of players and coaching staff bring a SJHL Championship back to Kindersley. I have had alot of people ask me what my new job will be, well I am going back home to Edmonton. I have accepted a news job at 630 CHED and iNews880. Some of you may be surprised to see that I am taking a news job, but this is a great way to get my foot in the door. I really do enjoy doing news, as my other job away from the rink has been broadcasting the Kindersley morning show news for the past year and a half, which I have really enjoyed. Having said that, my goal in the long run is to get into the 630 CHED sports department. They cover alot of sports at CHED, including the Edmonton Oilers, and Edmonton Eskimos broadcasts, along with a number of sports talk shows. I'm starting out at the bottom, but with my experience I have gained during my time in Kindersley, I feel I can climb the ladder in the near future. I will get to work with some of the best radio talent in Canada, and I feel that could go along way in my radio career. My goal is to still one day head back into the broadcast booth, and who knows what job openings may be open in play-by-play come next season. There are alot of people I want to thank for helping guide me along the way here in Kindersley. I really want to thank the McGrath family. Kelly and Daryl McGrath have been like my mom and dad away from home. I don't know how many times they have had me over for supper while I was here, they even let me stay at their home for the past month, during my time of transition to my new job. They are great people, that have really helped me along the way. Thank you so much for the hospitality, and I will miss the both of you. Having said that about the McGrath family, I also have to give a shout out to my buddy D Jay McGrath. Me and him really got to become good friends over the summer while most of the players were back home. He has become one of my best friends, and just like his parents, he is a great person. I'll miss ya buddy! I want to thank all the fans and parents for reading my blog over the past two seasons. I developed a passion for blogging and it was because of all you fans that checked in everyday to read what I had to say. I'm just a young kid with an opinion, and it meant alot to me to hear how many of you enjoyed reading this blog. I am going to keep this blog open for now so I can look back and reflect on my time with the Klippers. In the long run I may start up another blog, or switch focus with this blog, but for now it will remain pat with this final post. They say once you've been a Klipper you're a Klipper for life. I never wore the team sweater but I know I'll always care about the team. I'm no longer the broadcaster but today I become a fan. Lastly if anyone wants to stay in touch with me feel free to e-mail me at brendenullrich@hotmail.com I would love to hear from you in the future! I will be at Thursdays Klipper home game before I head back home to Edmonton Friday morning. I hope to see you down at the rink, it's been fun Kindersley!!! - That nasty losing skid is finally over for the Kindersley Klippers, more on Sundays victory shortly, but 1st we shall recap Friday and Saturday contests. - Friday night in Yorkton the Klippers were dropped by a score of 6-1 by the Terriers. Kindersley stuck with Yorkton through 20 and after the opening frame the score was 0-0. After 20 though the game changed. Yorkton would take their game to a higher level, and Kindersley was unable to match it. That and the fact that Warren Shymko was very good on the night for Yorkton, turning aside 33 of 34 shots faced. - Saturday night out in Melville, not so good for the Kindersley Klippers. A number of players were benched, and the team had no answer for the Melville trio of McNulty, Trudeau and Mireau. The 3 players combined for 12 points in the contest. 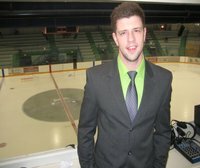 - Sundays broadcast was my final radio broadcast with the Kindersley Klippers. Before 5 minutes was even through in the contest, Kindersley was down 3-0. I was about ready to leave the broadcast for a moment, head down on to the bench and tell the team to wake up myself haha. I really wanted the Klippers to win the game for their own sake and also to make for an exciting final broadcast. Little did I know, it would be the perfect finish for both the team and myself. - Colby Daniels who was one of the players who was benched for Kindersley on Saturday night came out and played with a big chip on his shoulder. Justin Lund said it best during the 1st period intermission, Daniels was upset that he was benched, and wanted to go out and prove himself. He learned from the situation, came out in the 1st period and scored a goal and an assist. He really held the Klippers in the 1st frame, grabbing the bull by the horn, and scoring a late 1st period marker to give the Klippers some much needed life heading into the room. - I felt that the turning point in the game for the Klippers was when Brennan Bosovich dropped the mitts early in the 2nd period. Bosovich is not known for fighting, but he wanted to set the tempo early in the 2nd and he did just that. The Klippers were fired up on the bench, and they ended up scoring 2 goals to tie the game. - Brad Buckingham scored the 3rd Klippers goal. It was a 2 on 1, he had the option to pass, but was confident in his shot. He placed a nice little snapper short side to put the Klippers within one. - Beau Stewart would score the Klippers 4th goal, and boy was it a thing of beauty. It was 4 on 4 action, and the draw was in the Klippers end. Davies worked it over to Stewart on the wing, and he walked into the Yorkton zone. A few feet above the left side circle, Stewart launched a absolute rocket, that was labeled for the top corner. The net minder Thomson didn't even move, it was a riffle to tie up the game. - The 3rd period and regulation would solved nothing and we were headed to a shootout. Vlanich tried the one handed Forsberg move, but was stuffed by McDonald. Bosovich was 1st for Kindersley and he ripped one top corner to give Kindersley the advantage. Sookro was also stopped by McDonald, which paved the way for Daniels to win the game. Daniels tried to shoot but was stopped by Thomson, which meant that Giebel would have to score to keep the shootout going. Giebel made a nice move, pulled it from back hand to forehand, but McDonald would rob him with the glove to officially end the Klippers 12 game losing streak!!! McDonald was really good for Kindersley in the 3rd period aswell, which gave them a chance in the shootout. - Another impressive thing about the Klippers win was that they had no powerplays the entire game! - I was really pumped for the boys. They have been working hard, and haven't got a single bounce during their slump. They played a very solid team game, with each player feeding off of one another. They didn't give up after going down by 3 early, and deserved the victory! - I think the win will be a big confidence boost for this team moving forward. They are playing for pride the rest of the way through, and I think a few more wins are in store for the Klippers before the season is over. - Sunday was indeed my final radio broadcast for the Klippers. I will be broadcasting the game on the web cast Thursday, but the web cast doesn't have the same meaning as the radio for broadcasting. It was really nice to see the boys play the way they did, and it almost made me tear up during the broadcast. I will have more on my departure before the week is through, with a final goodbye blogpost. For now enjoy the call of the Klippers overtim win by clicking below. The Nasty Losing Streak Is Over!!! - Sunday was indeed my final radio broadcast for the Klippers. I will be broadcasting the game on the web cast Thursday, but the web cast doesn't have the same meaning as the radio for broadcasting. It was really nice to see the boys play the way they did, and it almost made me tear up during the broadcast. I will have more on my departure before the week is through, with a final goodbye blogpost. - 1st off I apologize for the game not being broadcasted on the radio. I forgot the power cord back at the radio station. This usually wouldn't be a problem because the board has a built in battery, but for some reason it wasn't working and I had no juice to broadcast the game . I think we should be good to go for tonight's game, as I am planning on meeting up with Craig Stein today from GX94 to borrow some radio gear. - On to the game, Kindersley had a really solid opening frame which saw them kill off a lengthy 5 on 3 and also head into the break scoreless through 20. - In the 2nd, Yorkton would elevate their game and Kindersley was unable match it. That's the problem, when the times get tough in the hockey games, Kindersley just doesn't have that fight back intensity. - Early in the 3rd the floodgates opened for Yorkton as they would score 3 goals in the opening 5 minutes of the period. The lone bright spot for Kindersley in that frame was youngster Kody Thue. He plays Midget AAA for the Yorkton Harvest, and got called up for his 1st SJHL game as a Klipper. Thues rights had come over to Kindersley, in the Jordon Hoffman trade. Anyways, off the draw, Geislinger won it back to the point, and Thue launched a solid wrister top corner glove side. For a dman, that's about as pretty as it gets for your 1st Junior career marker. Thue also had a pretty solid outing for Kindersley. He kept it simple, didn't make any mistakes and scored the only Klippers goal. - Kindersley has now dropped 11 straight contests, and things are looking doom and gloom right about now in terms of the rest of the season. Having said that, there are a few positives for Kindersly last night. Their penalty kill has been much more effective of late, and it showed last night when they killed off a 5 on 3 early. They are also generating good looks offensively. Kindersley mustered 34 shots on goal which is a positive. If they keep getting that many shots every night, the goals should come. Shymko was very solid on the night for Yorkton and earned the games 1st star. - The Klippers will depart for Melville tonight and then back to Yorkton Sunday to wrap up the road swing. I will tweet updates on the radio broadcast situation at some point this afternoon, but like I mentioned, we should be good to go for tonight's game. - Wednesday night Kindersley failed to bring a full 60 minute effort, which resulted in a 5-2 Melville victory. They showed bits and spurts of solid hockey, but overall it wasn't the same performance we had seen out in Weyburn on Sunday. The start wasn't pretty for Kindersley as the starting line of Mireau, McNulty and Wasden struck only 14 seconds into the contest. Melville elected to put Wasden with those 2 for the games opening shift and it payed off as McNulty potted his 25th of the season. That was the only marker of the opening frame and Kindersley would strike next in the 2nd period early on their 1st powerplay chance. D Jay McGrath walked off the wall and ripped one short side for his 10th of the season. Melville would take back the lead though and then go up by 2 before the period was over. Kindersley did make things interesting for a few moments in the 3rd when Davies got Kindersley within one. The next shift though a defensive zone breakdown lead to Melville going back up by 2. That must of been a huge let down on the bench for the team after fighting hard to get back and then to go right back down on the next shift. Melville would add another one in the 3rd to win by a final of 5-2. It has become evident that for Kindersley to beat these veteran like teams in the SJHL, that they will have to work their bags off for an entire 60 minutes, and be crisp all the way through, as one mistake seems to always end up in the back of the net. - Another tough weekend lies ahead for the Kindersley Klippers against 2 very talented Sherwood teams. Kindersley will play in Yorkton Friday night, Melville on Saturday night and Yorkton again on Sunday. Kindersleys special teams has been improving lately, which could be the key to Kindersley unlocking a victory this weekend. - I will have all 3 of the weekend broadcasts on 1330/1210 Classic Hits Radio. These will be my final radio broadcasts of the season for Kindersley and I am hoping the boys can pull through with a victory. Tonight marks game number 47 of 58 for the Kindersley Klippers, as they entertain the Melville Millionaires. Melville has won all 5 of the meetings between the 2 clubs so far this season, 4 of those Mills win came in regulation with 1 coming in overtime. Despite the lose on Sunday night out in Weyburn, Kindersley put together their most complete game of 2012. They will need to bring that kind of compete level once again tonight, but also find their scoring touch against a very explosive Melville club. This is a team that loaded up at the SJHL trade deadline bringing in veteran forwards Connor Bradshaw, and Taylor Wasden. They also got Sean Aschim back from the Seattle Thunderbirds in the WHL. In terms of Taylor Wasden, he will make his return to Kindersley tonight and I bet he gets a standing ovation from the Kindersley faithful. It will be interesting to see if anyone tries to drop the mitts with Wazy tonight, so far in 5 games with Melville, Wasden has been very discipline and hasn't racked up any penalty minutes. I know the Klippers players all respect Wasden as a player and a friend, but on the ice you have no friends, your opponent becomes your enemy. Kindersley will likely be without forward Tanner Kissick who is still recovering from an upper body injury. No word yet on when he may return to the lineup. I also want to mention that this will be my 2nd last home game broadcast of the season. I have accepted a radio job back home in Edmonton and will be leaving Kindersley on February 3rd. I will still get to broadcast this weekends road trip and also next Thursdays home game. In terms of the job I will get to an in depth blog post about where I am headed, and my time in Kindersley at some point early next week. I just wanted to put this out their since alot of people have been asking me about it. I hope to see you down at the WCEC tonight, the boys put on a very exciting performance on Sunday and I would expect to see that effort once again tonight! Well this one wasn't pretty for the Kindersley Klippers, and the game was essentially over after 20 minutes of action. Kindersley came out strong in the opening couple of minutes and maybe if they had scored the games opening marker the outcome might have been different. For Kindersleys sake, they unfortunately did not and Estevan would scored on their 1st quality chance of the hockey game. After Whitehill scored for Estevan, the train fell off the rails for the Klippers, and Estevan would pot 5 more before the period was over. The offense was split out as Froese, Brykaliuk, Neufeld, DoIchylo, and Milligan did the damage. Their isn't much more to say about the rest of the game, it did get a bit chippy, and Kindersley had a ton of PP chances. Estevan somewhat let off the gas however, and the final resulted in a 8-1 debacle. Saturday night Kindersley certainly brought a better compete level, but it wasn't enough to knock off the Notre Dame Hounds. For whatever reason, Kindersley always seems to struggle out in Wilcox. These struggles go back even to last season, as it just seems like its always a dull game in the Notre Dame barn. It's a tough rink to play in that really favors the home squad. It's a much bigger ice surface, and its hard to get amped up for a game when there is essentially 20-30 fans in the building. Having said that, this was a game that Kindersley could of won but once again they fell short. Special teams was the difference in this one, ad Notre Dame scored a short handed marker and also a powerplay marker in the 2nd period. The shorty was a rocket down the wing by Ben Morgan, and the powerplay was a sharp short side point shot off of the stick of Brandon Kuse. Midway through the 3rd period, rookie sensation Brandon Millin would score the dagger to put Notre Dame up by 3. Kindersley would add a very late marker on the powerplay as D Jay McGrath broke Reichenbachs shutout bid with 22 seconds left in the game. Some may have wrote Kindersley off based on the fact that it was a matchup that featured the Sherwood's best hosting the Sherwood's worst, but boy did the Klippers come to play on Sunday night. Kindersley came out the gate with all kinds of fire, and Brad Buckingham would put Kindersley on the board early with a powerplay strike. Kindersley continued to take it to Weyburn for the majority of the opening frame outshooting them in the period. Kindersley continued their strong play in the 2nd frame, but they were unable to beat Teskey and the Red Wings would jump on Kindersley with some timely scoring. Sanderson and Williams would put Weyburn ahead 2-1 after forty minutes of play. That's the thing with strong teams, they can dig deep and get timely scoring like Weyburn did in this one. The 3rd Period was more of an even frame, but the difference was Kindersley couldn't find that timely scoring touch, and their opponent did. Alex Laird had a great chance on a breakaway where he absolutely blew by the entire Weyburn team from the Klippers zone, but he was unable to beat Teskey. Colby Daniels also hit a goalpost with a quick snapper from the high slot to prevent a Klippers comeback. Hoffman had scored for Weyburn early in the frame to make it 3-1 and Pereira would add an empty netter to ice Kindersley vy a final of 4-1. Kindersley really deserved a better fate in this one, and they really elevated their game against a tough team that is virtually unbeatable on home ice this season. Players like Alex Laird, Travis Geislinger and Colby Daniels had very good games for Kindersley in the losing effort. Those were a couple of standouts, but the whole team deserve a mention for their effort. The key scoring for Kindersley unfortunately wasnt there, but this game will in my mind certainly serve as a big time confidence booster for this club moving forward. A glimpse of the future was on display Sunday night, and boy did it look promising for this Klippers team. Next up for Kindersley is Wednesday on home ice when they welcome in the Melville Millionaires and former Klipper Taylor Wasden. For all the Klippers road games, this will be the link to listen to the radio broadcasts online.